A classic baking potato is the russet, which is one of the most starch-filled in the world of spuds. That starch is released as the potatoes cook in the broth, becoming part of the underpinning of a rich, thick soup. Because of the millk and sour cream used in this recipe, it's not a candidate for freezing. Think outside of the bowl for serving up soup. Serve in mugs for an extra cozy feel, or hallow out a round loaf of bread to create a bread bowl. Imagine you’re at your favorite steakhouse, ready for an indulgent dinner. While you know the steak will be great, you have to admit that you’re most looking forward to the sides, which often turn out to be the stars of the meal. What, for example, could be better than the ultimate comfort food—a freshly baked potato, topped with all the cheesy, gooey, protein-rich extras that make it such a special occasion treat? Now that once-in-a-while steakhouse experience can happen every day, with a loaded baked potato soup that’s wonderfully hearty and supremely satisfying. 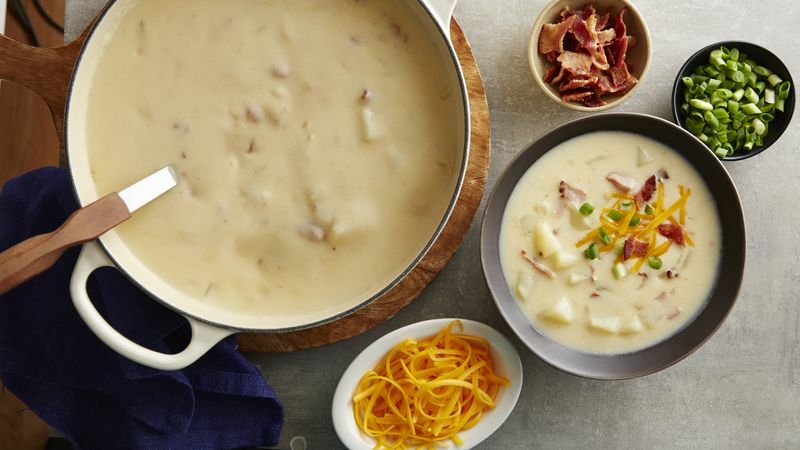 This recipe for potato soup includes bacon, onion, ham, sour cream, cheddar cheese, green onions—and plenty of potatoes, of course. Use a high-starch variety of baking potato, also known as a russet, for this recipe, to ensure that your loaded potato soup has a hearty body and a creamy texture. If you’d like to try more soup suggestions, there are plenty of stick-to-your-ribs favorites in Betty’s best soups collection.